It’s hot. By 9 a.m., a dusty desert film radiates hazy stillness over thirsty fields of produce. The air is dry as static, and temperatures are well on their way to a blistering peak of 103 degrees in the desert town of El Centro, California, 13 miles from the Mexican border. But Beiquan Mou, a research geneticist with the U.S Department of Agriculture, is buoyant, because his acre-wide field of green and purple lettuce is thriving in these oven-like conditions. Lettuce is a delicate mistress; it must be coddled and kept below 85 degrees or it will struggle — bad news for America’s salads, as scientists claim climate change is poised to turn central California, home to the nation’s “salad bowl,” into a dust bowl by the end of the century. Most of the year, 60 percent of all the lettuce Americans consume grows in the Salinas Valley, 500 miles from here, cooled by the Pacific breeze. Temperatures there hover at an average of 68 degrees. In El Centro, highs of 106 are not unusual. And that is why Mou is here. Someday, much of America’s prime agricultural land will be subject to the same weather conditions that conspired to make 2012 the hottest year on record in the continental U.S. Over the course of this century, North America will see longer periods of extreme heat. Farmers could see annual losses of $5 billion or more. Mou, tall and serious in a round straw hat, armed with clipboard and pen, is picking thick, green heads of iceberg and juicy-looking romaine in leaf-wilting heat. “The Margarita looks good,” he says, touching a tender butterhead cultivar, blooming in the cracked roseate sand. Since 2010, Mou has been on an epic quest for the world’s most heat-tolerant lettuces. Backed by a three-year federal grant, part of a $38 million effort to cope with climate change, he has growtested more than 3,500 varieties of lettuce and spinach in a heat chamber laboratory, exposing them to scorching temperatures and recording the results. The goal: Identify the hardiest species, and isolate their survival genes. Someday, hopefully, the winners of this gladiatorial death match will wind up on salad plates. The lettuce of the future may look and taste the same, but thanks to the research Mou has begun, its DNA will contain a heat-resistant gene to help farmers cultivate it pretty much anywhere — even the desert. By late May, Mou’s 84 finalists — 28 icebergs, 28 romaines and 28 butterheads — are ready to be picked and analyzed. They even have superhero names like Gladiator, Jericho, Sniper and Invader. Crouching in pristine, button-down ensembles, Mou and his assistant pile lettuce heads into containers and carry them back to their shade tent. They weigh them, test their firmness, split them open and measure their cores, taking note of tip burn and leaf stress. 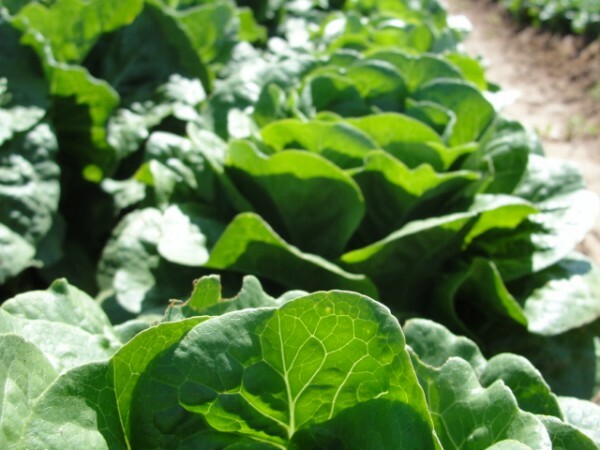 Many of Mou’s plants have grown into mutant parodies of supermarket lettuce. Some green-leaf varieties are more than a foot wide with heads bigger than wedding bouquets. Others have cooked in the sun so long they look like burnt marshmallows. The weirdest-looking lettuces have shot their stems 2ó feet into the air, growing leaves in the shape of Christmas trees. Called “bolting,” this is a survival tactic in which lettuce under heat stress tries to flower quickly in an attempt to reproduce. But Mou’s lettuce has to do more than look good. He bites into a tasty-looking iceberg cultivar called Glacier and makes a face. It is piercingly bitter. “In the Salinas Valley, that one tastes just fine,” he says, shaking his head. He uses his knife to slit open a neighboring iceberg. He nods in approval. It’s sweet. It will take trial and error to produce a lettuce that is both hardy and tasty. Global warming will dictate the world’s salad bar selection in the not-so-distant future, and Mou isn’t the only one rushing to condition our unprepared produce. One of the USDA’s top objectives in coming years is to identify crop varieties with the most resilient all-weather genes. In addition to Mou’s work, USDA plant physiologists in North Carolina are looking for soybean cultivars that can tolerate elevated ozone and carbon dioxide levels. In Wisconsin, scientists are adapting cranberries to unexpected frost snaps — another regional effect of climate change. In Maryland, researchers are studying crops that deliver better yields with higher levels of carbon dioxide. Mou won’t have results until 2014. But finding the world’s first superlettuce is only half the challenge. It will take time — and money — to find a way to crossbreed the lettuce genotypes with other existing strains. Charles Walthall, acting deputy administrator of the USDA’s Natural Resources and Sustainable Agriculture Systems program, says industry leaders like Monsanto are already focused on similar research. 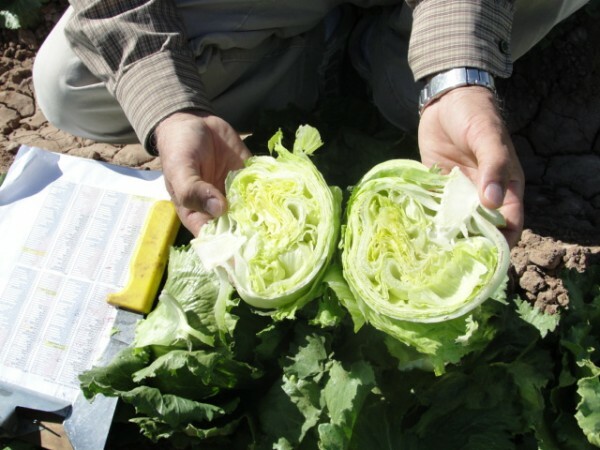 Syngenta, for example, has taken an interest in Mou’s study, and sent representatives to one of his lettuce fields. If all goes well, our lettuce may be more primed than we are to survive the hot, dry times ahead.